“The best music and the best whiskey come from the same part of the country.” Directed by James Szalapski, Heartworn Highways documents some of the leading singer-songwriters in the so-called Outlaw Country movement during the mid-1970s – some of which like Guy Clark (“L.A. Freeway”), Townes Van Zandt (“Waitin’ Around to Die”) and Steve Earle (“Elijah’s Church”) became legends, while a few talented performers such as Larry Jon Wilson (“Ohoopee River Bottomland”) and Steve Young (“Alabama Highway”) faded into obscurity. 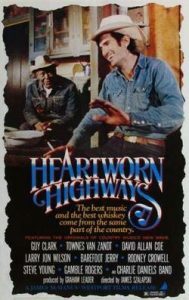 Other featured performers in Heartworn Highways include David Allan Coe (“Keep on Trucking”), Rodney Crowell (“Bluebird Wine”), Gamble Rogers (“Black Label Blues”), Big Mack McGowan & Glenn Stagner (“The Doctor’s Blues”), Barefoot Jerry (“Two Mile Pike”), Peggy Brooks (“Let’s Go All the Way”) and The Charlie Daniels Band (“Texas”). One of my favorite scenes in Heartworn Highways is the offbeat and somewhat disturbing interview with Van Zandt, portions of which later appeared in the 2004 documentary, Be Here to Love Me: A Film About Townes Van Zandt. By the way, Szalapski (1945-2000) later served as a live-action special effects cinematographer whose work included the theatrical teaser for Alien (1979), the after-life scene in Resurrection (1980), the opening title sequence in The World According to Garp (1982) and scenes from Ladyhawke (1985).